Bright Star Touring Theatre, a national professional touring theatre company based in Asheville, North Carolina, will open the fifth season of the Hanson Theatre Living Room Series hosted by The Mendel Center at Lake Michigan College. The performance of their acclaimed show Alice in Wonderland is scheduled for Saturday, October 27, 11 am. The Lewis Carroll literary classic is magically brought to life in this 45-minute adventure. Join Alice on her journey into the rabbit hole packed with some eccentric and fantastical character who take you on an imaginative ride. Since 1865 this literary classic has been a favorite among young readers. Join the Queen of Hearts, the Cheshire Cat, the Mad Hatter and Alice on this adventure in Wonderland. Audience members are invited to dressed up in their favorite costume for Halloween fun after the show. This performance is great for children in grades K – 5 and their families. Each year, Bright Star Touring Theatre serves nearly 1,400 audiences in schools, theaters, libraries, museums, and more across the country. They offer a wide variety of curriculum-based programs ranging from The Lady of Bullyburg to Heroes of the Underground Railroad. The company has gained international support, accepting an invitation from the U.S. Embassy to visit Moscow, Russia, with their programs. Bright Star is committed to providing professional theatre to audiences at an affordable and all-inclusive rate. Information about all their interactive shows, including production videos, photos, study guides, and more is available at www.brightstartheatre.com. 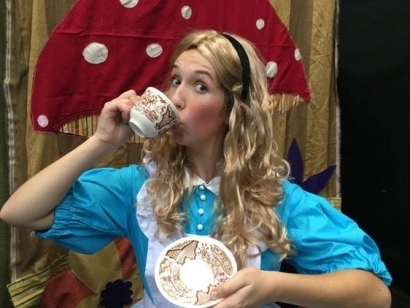 Tickets for Alice in Wonderland are on sale at www.TheMendelCenter.com, through The Mendel Center box office at (269) 927-8700, option 1, and in person weekdays from 10 am to 6 pm at the box office located in The Mendel Center, 2755 E. Napier Avenue, Benton Harbor.